A cultural ambassador for Senegambia, King has created the Safara Music School in Melbourne where he teaches hand percussion to various levels. King has been artist in residence at numerous pre, primary and tertiary institutions in Australia and abroad, having earned a reputation for versatility and sensitivity for his school workshop program �enhancing cultural awareness through music�. Safara music school works in close collaboration with organisations such as Multicultural Arts Victoria and City If Melbourne�s Art Play facility. King�s drumming and instrument making workshops provide all participants with the opportunity to participate in group tuition in an atmosphere of discovery and challenge. 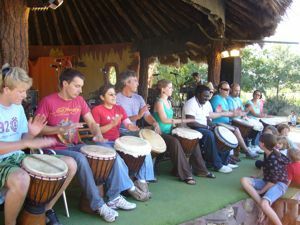 With emphasis on the body/ kinaesthetic and musical / rhythmic intelligences, and combining the different learning styles of visual, aural, read/write and kinaesthetic, King believes �that anyone with two hands can pick up drumming techniques.� As an experienced instructor, he skilfully blends demonstration with expectation to develop rhythm, tone and technique in all students regardless of age or background experience. Designed to engage and entertain participants of all ages, abilities and backgrounds these hands-on percussion workshops have been a hit at many of the nations major music festivals and cultural events and enable participants to experience the pulsating rhythms and instruments of West Africa for themselves. Click here for a list of Festivals, Gig’s, Workshops and other events that King has performed in.